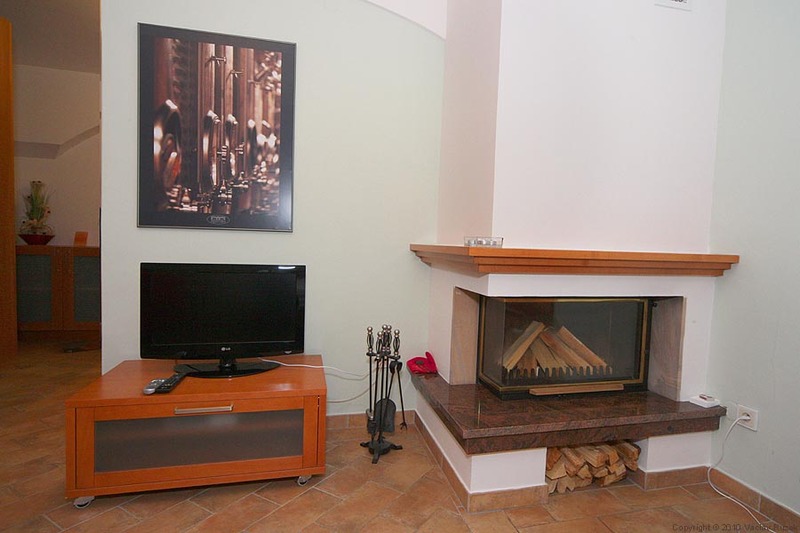 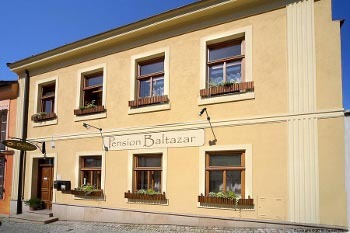 Pension Baltazar is located in the centre of the beautiful south-moravian town Mikulov directly under the Chateau. The history of Mikulov goes back to the beginning of the 12.century, in the year 1279 the city was founded. 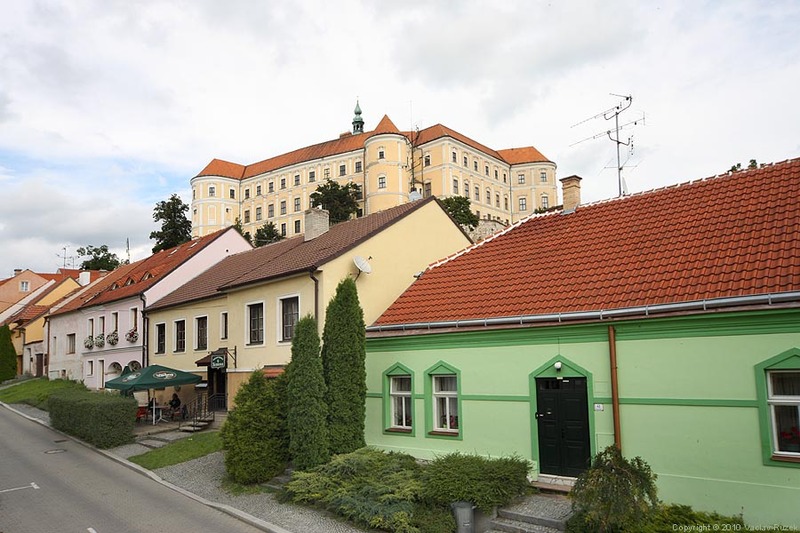 The history of Mikulov goes back to the beginning of the 12.century, in the year 1279 the city was founded. 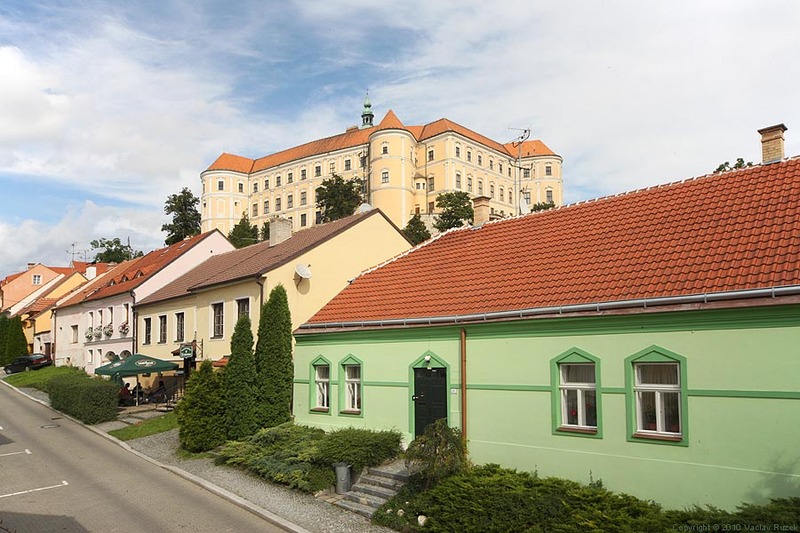 The town of Mikulov is characterized by its panorama of a Baroque chateau, the Renaissance spire of the Church of St. Wenceslas and the Holy Hill on the foothills of Pavlovské vrchy. It boasts a lot of significant religious sights. The oldest preserved records about the house are from year 1847. This two-storeyed house represents an above-average work of the very late classicism from mid to third quarter of 19th century. 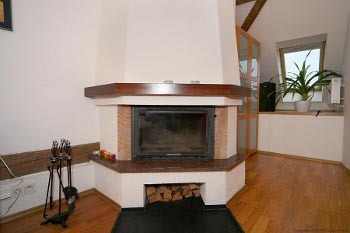 The house builder was a member of the Jewish Community in Mikulov. The residential object is preserved in the original mass appearance, including parallel saddle roof combined with the pult of the additional but also classicistic court flanker. 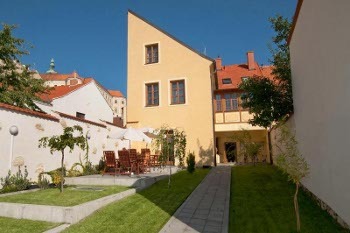 The main house frontage is preserved in the late classicistic axial arrangement. 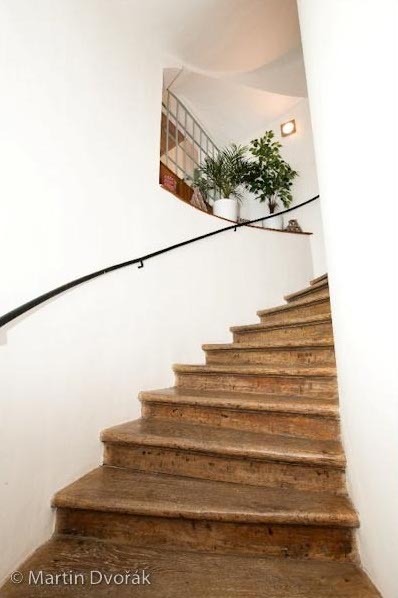 In the interior house equipment, the following elements can be considered for valuable ones: natural stone flooring on the broad step, oak staircase to the first floor including iron handrail of circle cross-section, classicistic adaptation of internal entrances, glassed-in veranda made in combination of diagonal web with wooden frame performed on a high level joinery at that time. This veranda is closed by safety roll-top made from corrugated iron. 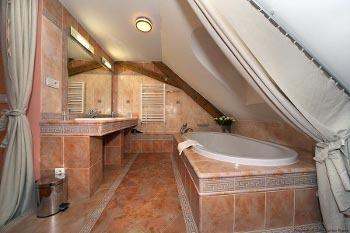 In the garden part of the house, a 10 m long arched cellar made from bricks and Muslov limestone was discovered. 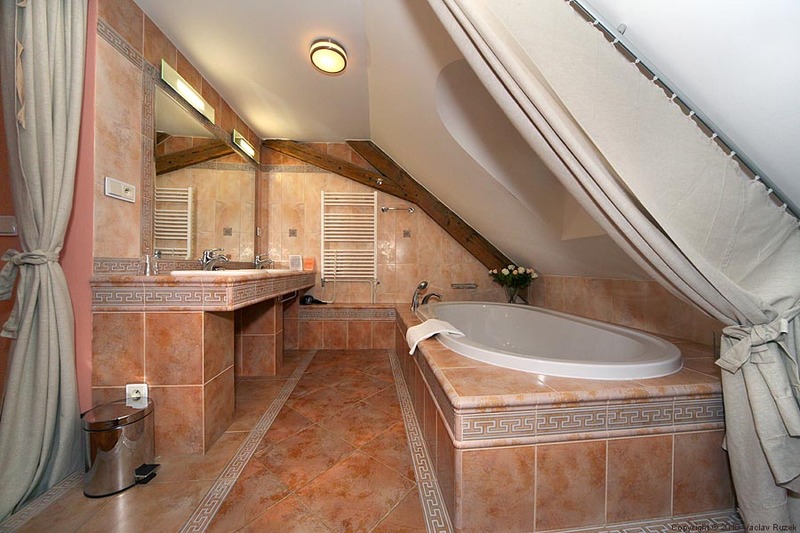 A historically valuable element in the garden is the old Jewish stone well that will be subject of further investigation with the aim to discover its original beauty. 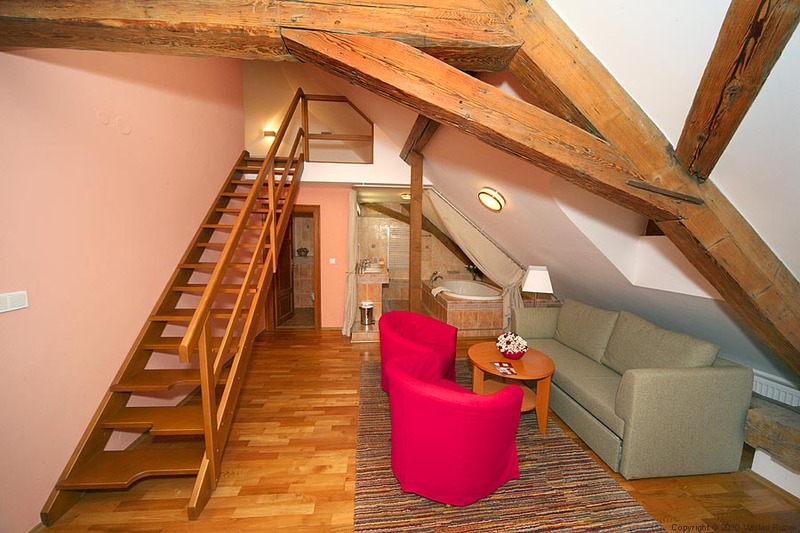 Room on the ground floor with a nice view of the scenic Husova street. 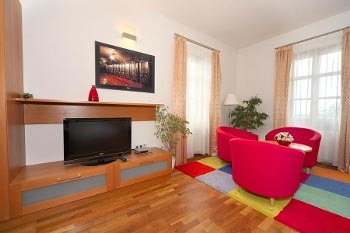 Equipment: LCD TV SAT, Wi-Fi, minibar, fireplace, WC, bathroom with shower, hair dryer, umbrella, 2 armchairs, sofa bed, standard lamp + small lamps. 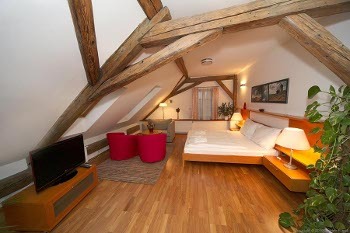 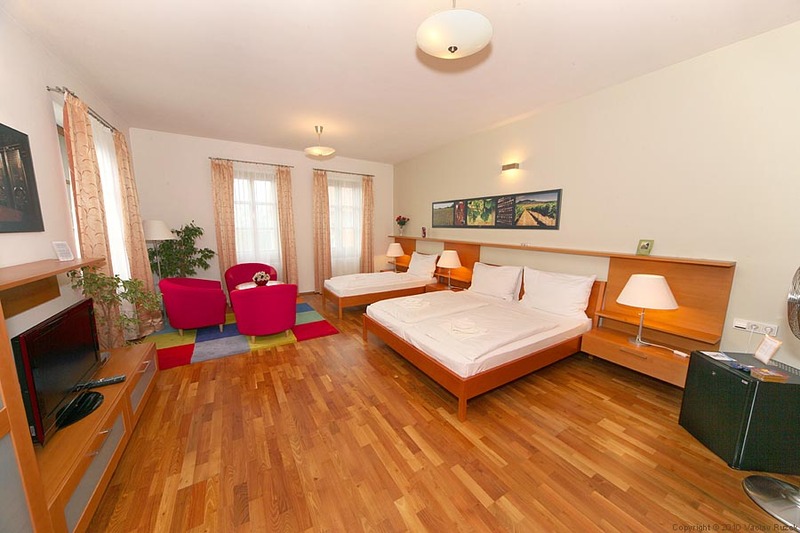 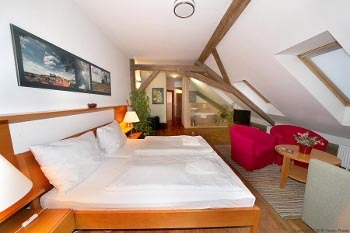 Room in first floor with the view of the Dietrichstein chateau and scenic Husova street. 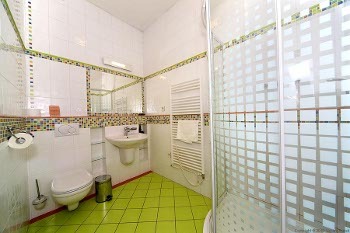 Equipment: LCD TV SAT, Wi-Fi, minibar, WC, bathroom with bathtub, hair dryer, umbrella, 2 armchairs, standard lamp + small lamps. 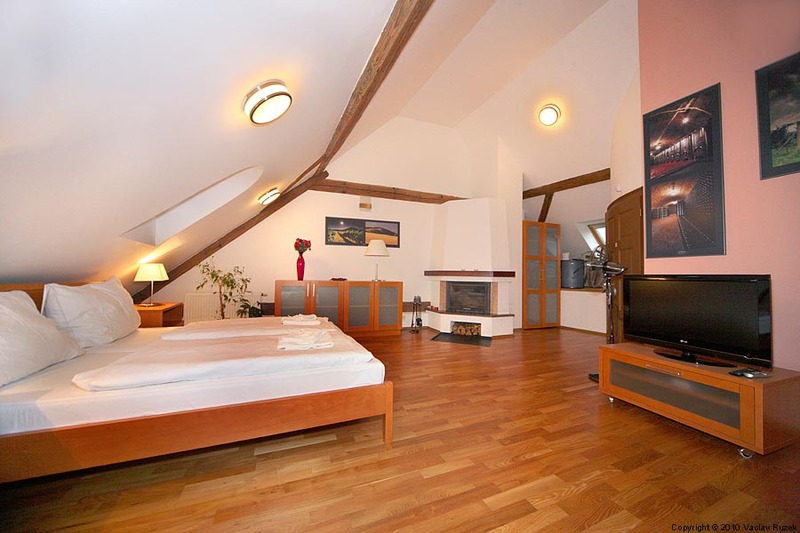 Room in first floor with the view of the Dietrichstein chateau and scenic Husova street. 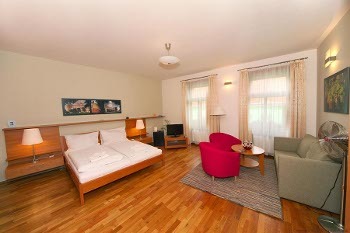 Equipment: LCD TV SAT, Wi-Fi, minibar, WC, bathroom with shower, hair dryer, umbrella, 2 armchairs, sofa bed, standard lamp + small lamps. 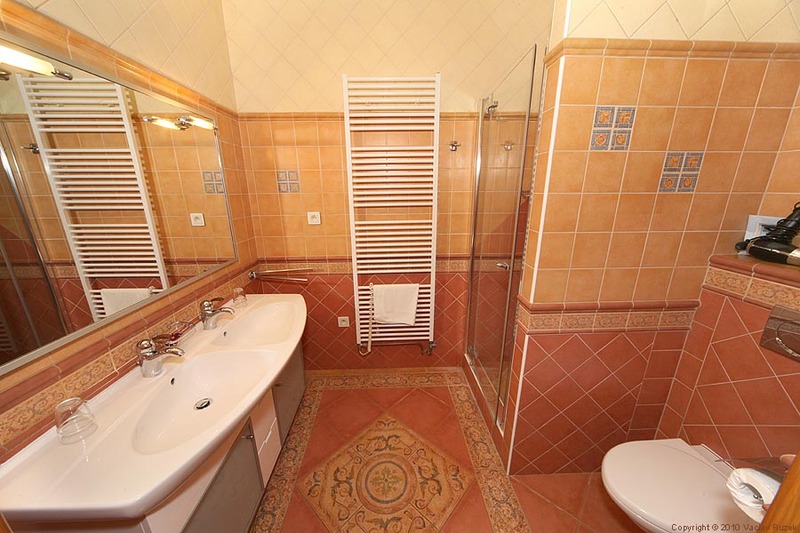 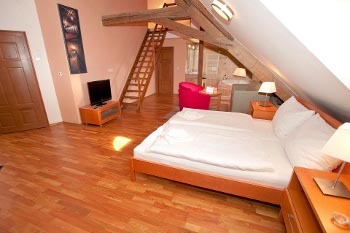 Room on the first floor with the view of a part of the town and South Moravian landscape. 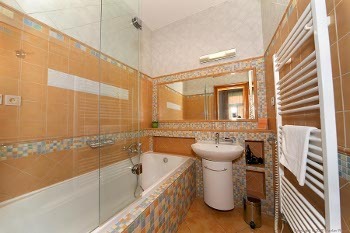 Equipment: LCD TV SAT, Wi-Fi, minibar, WC, bathroom with shower, hair dryer, umbrella, 3 armchairs, standard lamp + small lamps. 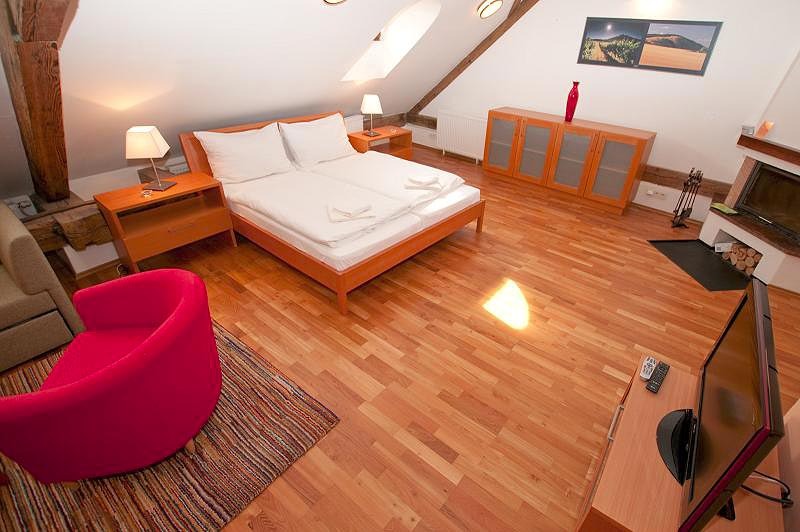 Room on the second floor with the view of a part of the town and South Moravian landscape. 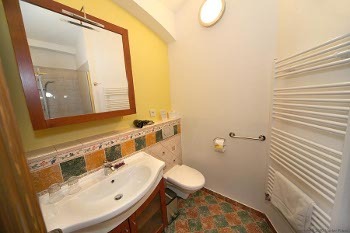 Equipment: Air conditioning, LCD TV SAT, Wi-Fi, minibar, WC, atypical bathroom with bath looking over the whole room, hair dryer, umbrella, 2 armchairs, sofa bed, standard lamp + small lamps. 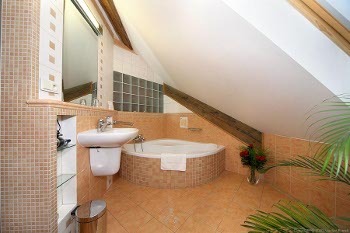 Suite on the second floor with the view of Dietrichstein chateau, Holly Hill and scenic Husova street. 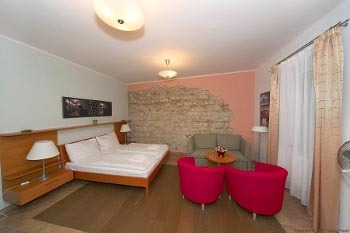 Equipment: Air conditioning, LCD TV SAT, Wi-Fi, minibar, fireplace, WC, atypical bathroom with a big bath looking over the whole room, hair dryer, umbrella, 2 armchairs, sofa bed, standard lamp + small lamps. Breakfast is served between 8.00 and 10.00 a.m.: 4 kinds of bakery, jam, honey, processed cheese, yogurt, muesli, butter, Nutella, 2 kinds of fruits, pastry, chicken frankfurter, hard cheese, 2 kinds of sausage, scrambled eggs, orange and apple juice, milk, cream, instant coffee, Espresso against surcharge, min. 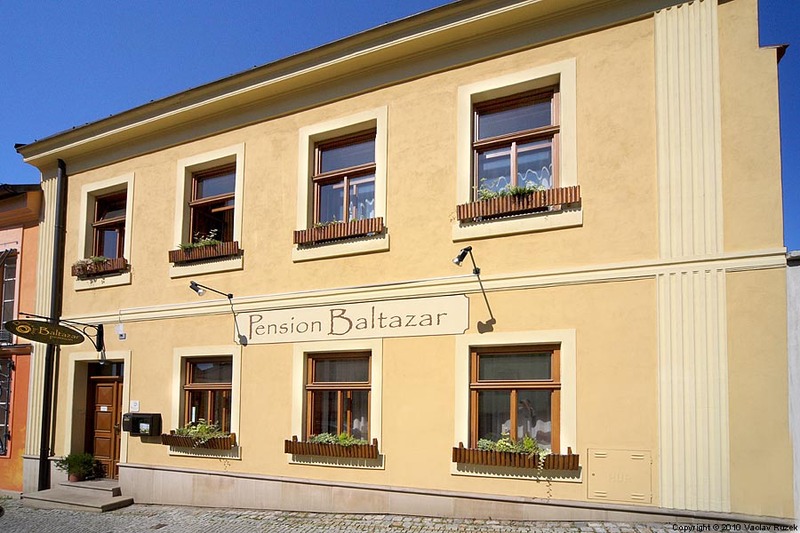 6 kinds of tea and newspapers. Prices include Wi-Fi internet connection, permit for parking on the premises and VAT, but dont include breakfast. 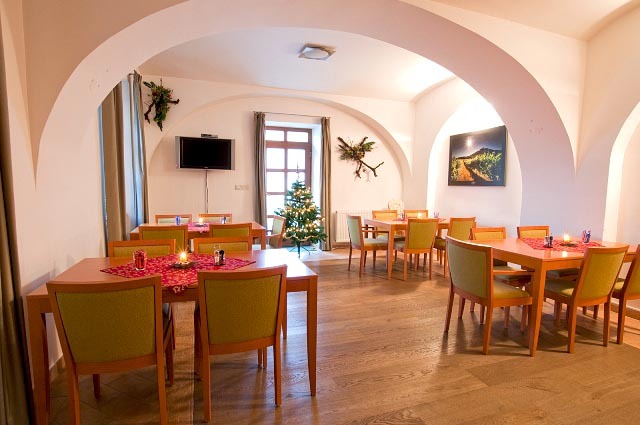 The price for the breakfast is 120 CZK per person.